Hospital equipment, computers, nylon, carbon black , polymer pipes and insulation: widely applied plastics – petroleum products. They have made modern global civilization possible far beyond oil and natural gas used in heating, cooling and transportation. Asphalt- a left over from oil refining – offered an alternative to imported bitumen. President Ulysses S. Grant first directed that Pennsylvania Avenue be paved with Trinidad bitumen in 1876. Thirty-one years later, asphalt derived from petroleum distillation was used to repave the famed pathway to the Capitol. The president’s road paving project covered about 54,000 square yards. The world’s first synthetic fiber – nylon – was discovered in 1935 by a former Harvard professor working at DuPont’s research laboratory in Delaware. The petroleum product “Nylon 6” was created by professor Wallace Carothers, who produced a polymer string that stretched. To make Hula Hoops and Frisbees, Arthur Melin and his Wham-O Company partner Richard Kerr, chose a newly invested plastic called Marlex. The world’s first high-density polyethylene, Marlex was invented by two research chemists at Phillips Petroleum Company in Bartlesville, Oklahoma. A 19th century petroleum product made America’s 1969 moon landing possible. Kerosene rocket fuel powered the first stage of the Saturn V of the Apollo 11 mission in July 1969. The Saturn V’s five first-stage engines burned “Rocket Grade Kerosene Propellant.” They consumed 2,230 gallons per second – generating almost eight million pounds of thrust. Booming Pennsylvania oilfields led to new petroleum products, supplying oil and natural gas feedstock for Binney & Smith Company’s carbon black, which won an award at the 1900 Paris Exposition. The company then took common oilfield paraffin and changed the company’s pigment destiny by famously adding color crayons to children’s imaginations. After General Motors scientists discovered the anti-knock properties of tetraethyl lead gasoline in 1921, American motorists would be saying, “Fill ‘er up with Ethyl.” Although it’s properties proved vital for aviation engines during World War II, phase-out for use in car gasoline began in 1976. As America’s enthusiasm for “horseless carriages” soared, so did demand for gasoline. S.F. Bowser gasoline pumps fueled a growing number of customers. Here is an educational Library of Congress photo of a 1920 gas station and its attendant on North Capitol Street in Washington, D.C.
Construction of the refinery in Whiting, Indiana, began in 1889. Beginning in the 1890s, the Whiting refinery of Standard Oil Company of Indiana processed crude oil into petroleum products a growing number of people and businesses needed: axle grease for industrial machinery, paraffin wax for candles, kerosene for home lighting. Soon the world;s largest refinery added gasoline production. 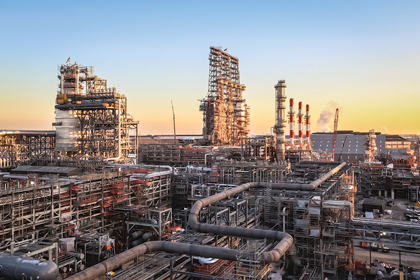 BP completed a multi-year, multi-billion dollar modernization of the Whiting refinery in 2013. Paraffin, a byproduct of the petroleum products of distillation, found its way from refinery to marketplace in the form of candles, sealing waxes – and peculiar American candies. An inspired Buffalo, New York, confectioner soon used fully refined, food-grade paraffin and a sense of humor to find a niche in America’s imagination. Here is an unusual petroleum products tale: the crude story of Mabel’s eyelashes. A young New York chemist distills paraffin from Pennsylvania oilfields into petroleum jelly – Vaseline. His incredibly popular invention will lead to creation of an equally popular mascara and Maybelline cosmetics.